Rainy and Slushy day — excellent for sketching. To me, there is nothing better that a cold rainy/slushy day for sketching. So today will be very productive for me. As promised though, I am going to post some sketches from the last few days. By tonight, I can post my rainy day sketch. Although feet are not beautiful by any means, I had nothing else to draw while laying in bed on January 3rd. 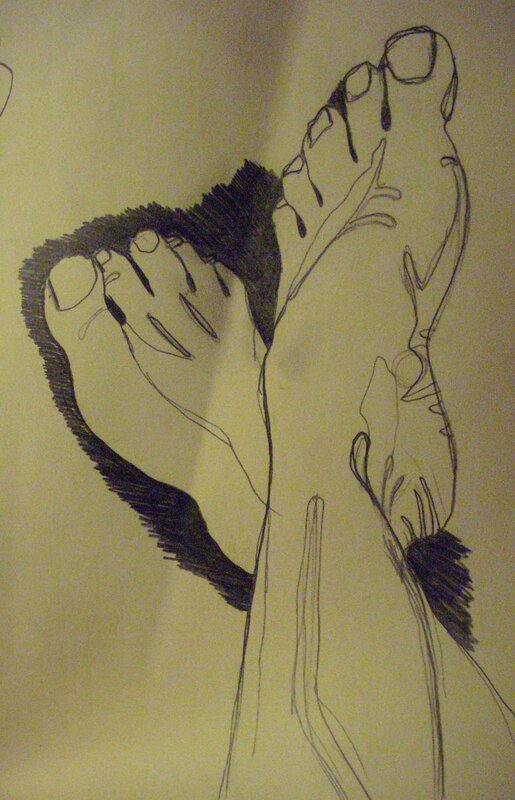 To make the subject of feet more interesting, I drew the shapes of shadows instead of adding actual shading. I began to color around the feet with pencil but never finished. My very favorite sketching pencil is a mechanical .05 lead. I like the fine line it gives me to add detail and oh yes, I never have to sharpen it. This makes it a great pencil on the go as long as you have a full stack of replacement lead in your bag. I am excited to say that I will be taking my sketchbook out ALL day Saturday. January 10th is the 1st official sketch crawl of 2009. I learned about it through another artist online. If you would like to sign up just go to http://www.sketchcrawl.com. It is a place online where artists from all over the world can sign up to sketch where they live on the same day! So artists all over the world will be out sketching their surroundings this Saturday. When they get home, they upload their sketches and share them. What a wonderful way to visit other parts of the world!!!! I think it is just amazing and I give full kudos to the inventor of this activity.